David is the name given to two sculptures by the early-Renaissance Italian sculptor, Donatello. In 1408, the artist was tasked to carve a marble statue of David, who was a biblical character that fought courageously against the gigantic Goliath. The commission to complete this project came from the Cathedral of Florence’s operai, who wanted to embellish the buttresses of the cathedral’s tribunes with 12 images of prophets. The sculpture was among Donatello’s early works, and it featured the artist’s immense talent and unique approach to sculpting. The David in marble, as presented in this famous artwork, stands in a sophisticated Gothic manner. 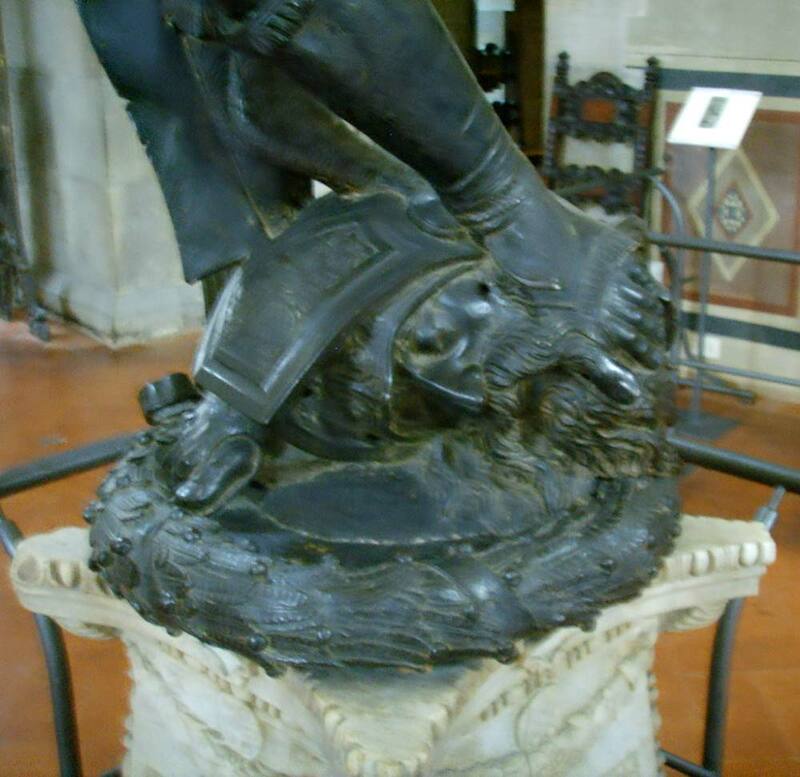 Although the face appears to be rather blank, as typical of Gothic art styles, David seems quite unaware of his foe’s head that rests firmly between his feet. Some art scholars have depicted a hint of personality such as slight cockiness, which was suggested by the subtle twist of David’s torso and the appearance of his left arm. However, the figure seemed bland, as compared to other popular sculptures at that time. The bronze version of this statue was as popular as the bronze cast that was completed during the Renaissance. This work of art features David with an enchanting smile, as he stands with his foot on the severed head of Goliath, after the giant’s defeat. This noble youth wears a pair of boots and a hat topped with laurel, and he bears the sword previously owned by Goliath. The Medici family commissioned the sculpture, and it was placed in the Medici Palace’s courtyard, in Florence. This action showed by the family showed that they are capable of owning the sculpture, which was considered as the symbol of Florence. Since this was considered as a scandalous act during that time, Donatello decided to end the issue by explaining that David‘s identity was merely an ordinary sculpture. The statue stood proudly on a column that was designed by the talented Desiderio da Settignano. It was situated in the middle of the Palazzo Medici’s courtyard, with an inscription that explained the significance of the statue as a highly regarded political monument. While the political significance of the sculpture was accepted, the precise meaning of the inscription has become a debatable topic among scholars. A number of scholars assume that the statue was originally commissioned by the affluent Cosimo de Medici, although the date of creation is widely disputed and unknown to many. Nevertheless, the sculpture presented the majesty of this noble and young hero that stands proudly with a sword in his hand, as well as the decapitated head of Goliath at his feet. In both statues, David appeared as a physically delicate and quite effeminate being. According to art scholars, the head of this young man was inspired by Antinous’ classical sculpture. Antinous was a famous Hadrian renowned because of his immense beauty. The physique of the sculpture, on the other hand, was rather ambiguous, yet alluring. It also depicted how the youth was able to overcome the mighty Goliath with the help of God instead of his own strength. 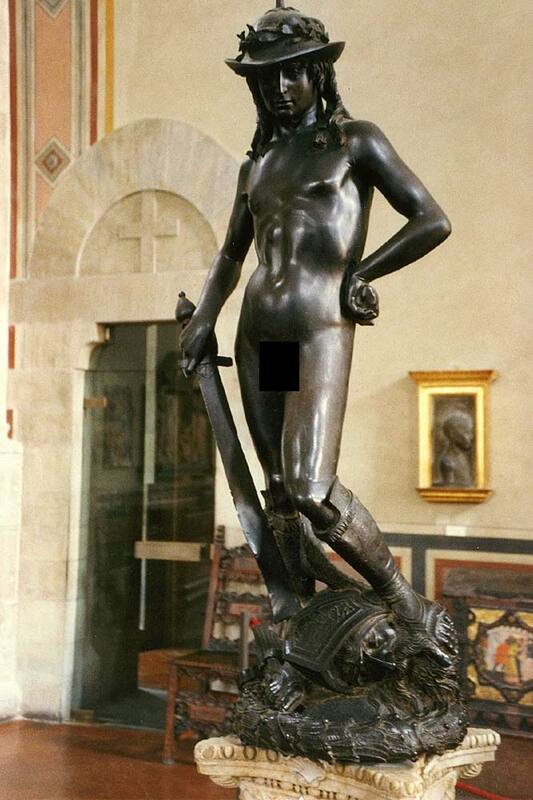 Nevertheless, this masterpiece by Donatello has remained as one of the topics among scholars. They believe that the nakedness of the young boy implies the concept of God’s presence in him, and it contrasts the appearance of the heavily-armored Goliath on his feet. David is also presented as an uncircumcised young man, as it was quite a common feature in most Italian Renaissance paintings or sculptures. 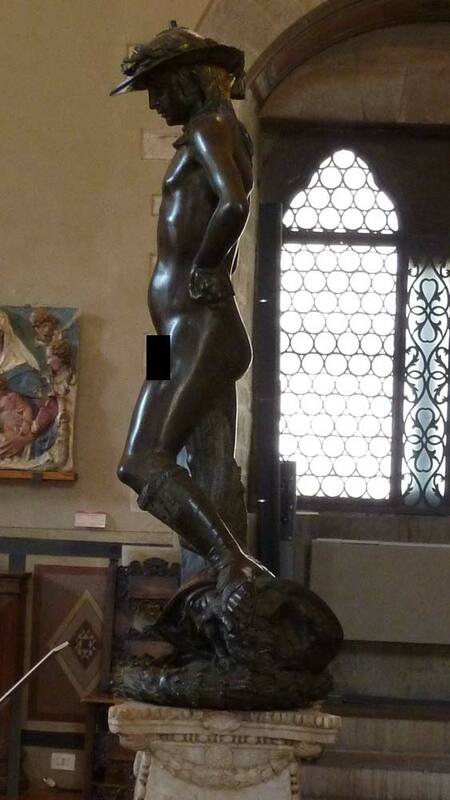 There was an absence of contemporary responses to the sculpture David by Donatello, yet the mere fact that this work of art was not placed in Florence’s town hall during the 1490s has caused some controversies about this magnificent piece. In the earlier parts of the 16th century, the Signoria’s herald described the sculpture in such a manner that suggested something that was quite unsettling about this masterpiece. According to the Herald, the sculpture positioned in the courtyard was far from being perfect because of the “tasteless” appearance of its right leg. However, the Vasari began pertaining to the statue as naturalistic and that it was probably created from life. There were other scholars that regarded this artwork as one of the finest accomplishments of Donatello during his life as an artist in the Italian Renaissance Era. I do consider all of the ideas you’ve presented on your post. They are very convincing and can certainly work. Still, the posts are too quick for beginners. Could you please lengthen them a bit from subsequent time? Thank you for the post. I looked up information about the renaissance period for my art class and it had each step I needed to complete my project (description, analysis, interpretation, and judgment.) this is a good sight to get the information you need to analyze artwork. thank you for reading my comment.